When my friend and pastry chef Marisa Churchill came to LA for a segment on The Talk, she told me that it was up to me to select where we ate. 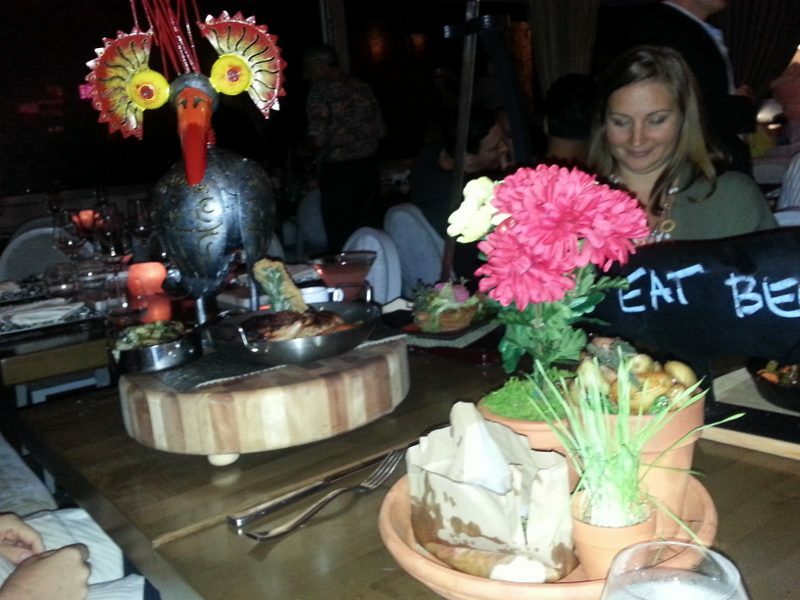 But, then she called and said she had one request – could we go to the new Barton G which opened on La Cienega. Why? Well, let’s put it this way and see if this tune rings a bell……. “Come with me, and you’ll be, in a world of pure imagination. Take a look, And you’ll see, Into your imagination. Wanta change the world? There’s nothing to it. Willy Wonka and the Chocolate Factory is every child’s dream. Who doesn’t fantasize about walking through the candy fantasy land with rivers of chocolate and trees of gumdrops? At Barton G, this magical world comes to life, with a little twist ala Stanley Kubrick and Salvador Dali. We were seated at our table and presented with a Bag of Dessert Menus and the sugar rush was on. 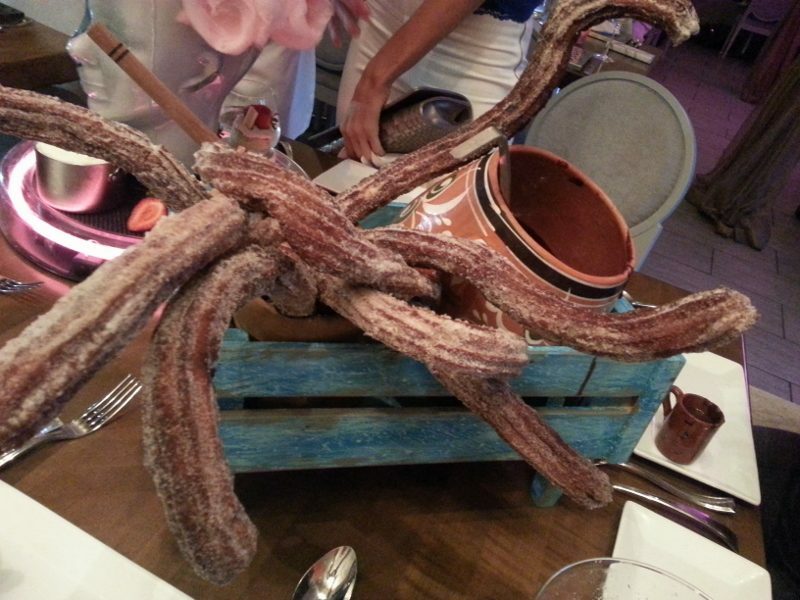 The churros looked like a giant octopus or the head of Medusa as they were placed at the table. But, these were darn good churros, perfectly crispy on the outside and soft on the inside with hot dark chocolate that was poured into individual cups. 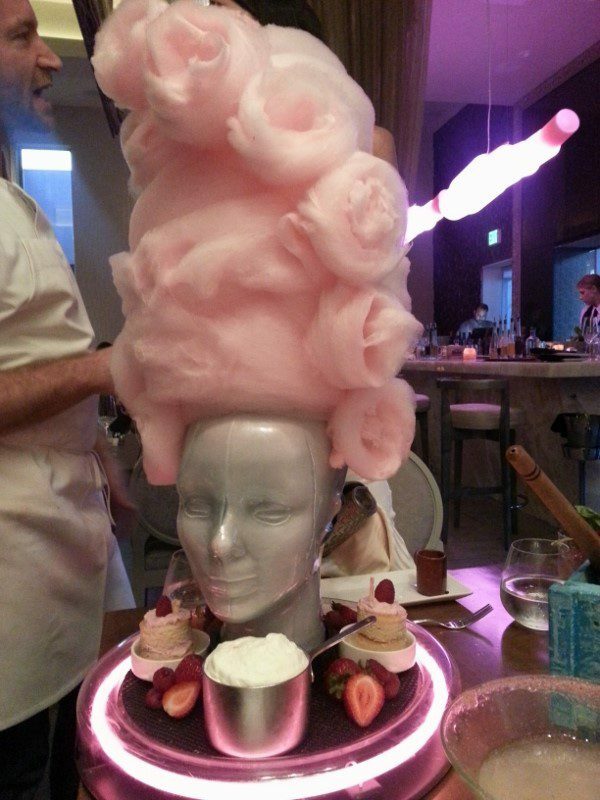 I just love cotton candy but even with four of us, we couldn’t finish the entire wig….but I personally tried! As for the desserts around the head, ooh that sclag (whipped cream) was so light and tasty that after dipping the berries in it, we started mixing it with the hot chocolate from the churros. Granted we were already in the deep throws of a sugar rush, the s’mores pizza was over the top. 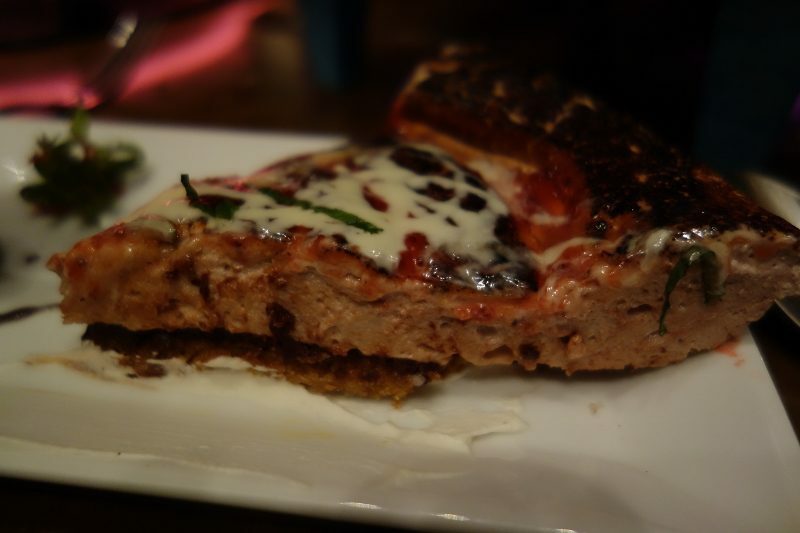 While it looked like a savory, cheesy pizza, it was all marshmallow. The marshmallow was fresh and delicious but it was so sweet that we couldn’t get through our individual slices of the pie. 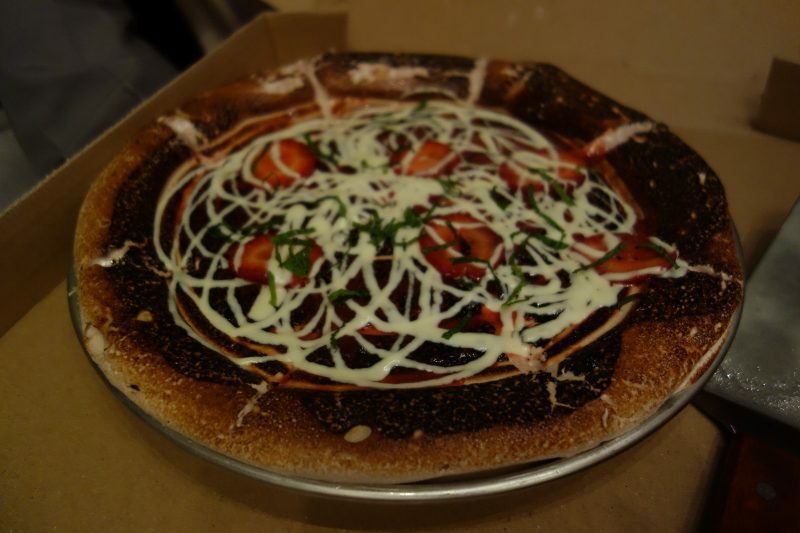 The basil was a nice touch on top of the strawberry sauce but this was still too sweet for even me. Each dessert was over-the-top in both decor and in portion and so yummy! And, of course, we washed the desserts down with cocktails. But, like the food, these were not your average cocktails thanks to the Below Zero Nitro-Bar where liquid nitrogen, a cryogenic fluid with a temperature of -320° F., is used to freeze the alcohol into popsicles. Not all drinks use liquid nitrogren and we also enjoyed a Jala-Migo. But, just because there isn’t smoke, popsicles and chocolate monkeys, it sure had a ginormous basil leaf. 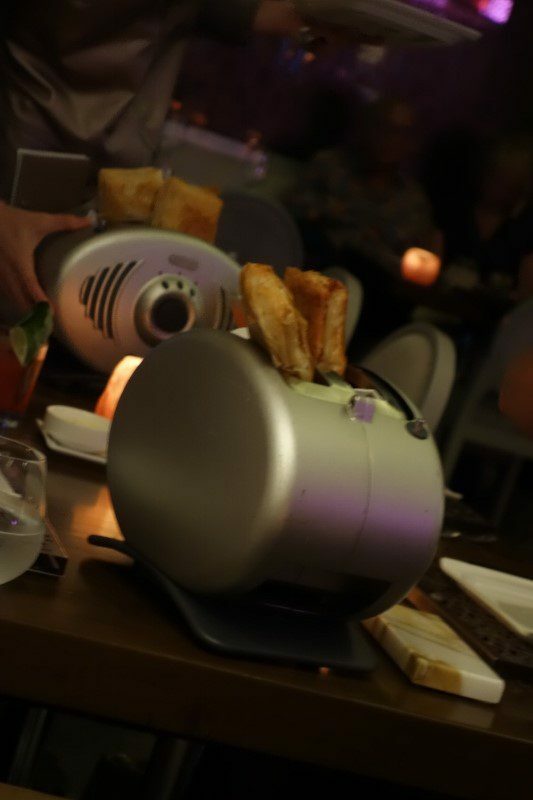 Eating out is always an experience but at Barton G, experience is taken to another level. Whimsy abounds but there is substance behind it. While we may have walked out with the biggest sugar high ever, the desserts did not disappoint and next time I will have to go in to try savory dishes like the New York steak served with a four-foot fork, popcorn shrimp delivered in a popcorn machine or lobster pop tarts presented in a toaster at the table as we observed at other tables. You really have to see it to believe it as Barton G is pure imagination. This entry was posted in Cocktails, Food and tagged Barton G, Cocktails, cotton candy wig, desserts, DrinkWire, La Cienega, Liquor.com, Los Angeles, s'mores pizza, sugar rush by Allison Levine.